Zak Irvin on UW making its move: Being on the road and Wisconsin being a great team, we knew Wisconsin was going to make a run. The #Badgers had 30 points in their first 41 possessions. They had 38 over their final 21 possessions. #Badgers Zak Showalter 0 pts, 3 rebounds and 2 assists first half. Finished with 6 pts, 5 reb + 3 assists. Huge block. Jordan Hill (5 pts, 3-4 FTS; and 1 board) gave #Badgers 13 solid minutes. John Beilein said the first 3-pointer for Koenig on his 10-0 run was a play they had not seen on film. John Beilein on being 2-16 vs. Wisconsin: Those two games were great freaking wins. Michigan's Beilein not happy with fouls (21) and #Badgers shooting 24 FTs. "It was confusing." Beilein deadpans on his record vs. UW: "Two wins. Those games were great freakin' wins." Please stop arguing that #Badgers Hayes didn't PLAY well. He didn't shoot well. Beilein on the foul calls: It's all confusing. We lead the nation in not fouling. It's confusing what happened, so we'll just let it go. John Beilein on all the fouls: It's confusing. We lead the country in not fouling. It's confusing. We'll leave it at that. Beilein now 2-16 vs. #Badgers : "Two wins. Those games were great freakin' wins." Having fun in a tough moment. Greg Gard: Typical Big Ten game with how physical it was. Gard acknowledged the FT numbers (14-for-24) but, "We knew we could score there with the clock stopped ... That was going to be important." Thanks for the good vibes. ???? Gard felt at times Happ was rushing his shot but became pretty effective as the game wore on. "His teammates picked him up." Gard said the elevator screen for Koenig for the open 3 at the top of the key was put in on Sunday and the first time UW had run the play. The first big 3 by #Badgers Koenig -- off double screen -- was something UW put in this week. Michigan hadn't seen it. Koenig said UW winning the 50-50 balls got the group "hyped up" down the stretch and turned things around for them. 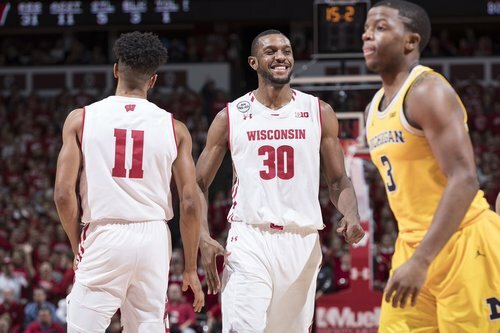 Nigel Hayes: That's what we expect in the Big Ten, good grind-it-out (games). #Badgers Hayes came back in with 11:59 left and was primary defender on Irvin, who then went 1-4 with 1 TO/1 assist. #Badgers Koenig left interview room limping (left leg) and with a patch on his chin. Got popped there early.